The Gee Brothers: A penny saved is a penny earned...Myth? A penny saved is a penny earned...Myth? A penny saved is a penny earned. There is perhaps no more common a financial expression/advice in the English language as this. The problem is, it is simply not true. Not only is it not true but it is so oft repeated that people actually believe it and believing it can lead to some very destructive financial behavior. This myth is tied to several other myths including, if I earned more money I would be better off financially. I will write about that one later. So, what is wrong with this cliché? A penny saved is far more than a penny earned. In fact, the two are not even close. Many people say it takes money to earn money. This too, at least, in its intent is a myth. (again, for another day). The more appropriate wording would be it costs money to earn money. The biggest reason for this is our current taxes. For most Americans, federal income tax takes 15% to 34% of everything they earn. That is only income tax, then you have Medicare and social security. If you own a home you will pay property tax and wherever you chose to spend that money you will likely have another approximately 7% on sales tax. Depending on what state you live in you may also have state income tax. I am religious and pay 10% in tithing to the Lord (best financial decision I ever made, again, for another time). Therefore, depending on who you are, based on simply the math a penny saved could easily be worth as much as two times a penny earned. But that is just the beginning. The true power in saving is restricting our life style. Once we spend money or expand our lifestyle it is very hard to pull the reins back. Simple example, yesterday I had an all-beef hot dog, it is going to be hard to buy those half chicken, half pork, half cat hot dogs again. So, once we expand to a certain life style we are setting ourselves up to stay at that life style. Especially if that life style involves payments (car, home, phone etc…). That means for many purchases that spending that penny means you are setting yourself up to need to spend it again and again and again. By saving or restricting your lifestyle you are avoiding potentially years of further financial pressures. I will expand on this in many other of my myth posts. So, next time you hold that penny. 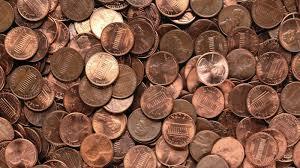 Realize that, for most of us, a penny saved could be worth two pennies earned, and perhaps even more. I like the original form of this proverb: "A penny spar'd is twice got." Looking forward to reading more of your eclectic posts! A much more true quote. I shouldn't have done it, now I can't go back.